Gyongyi, who goes by Ginger since moving to Pittsburgh, is a licensed esthetician and makeup artist with 28 years of experience. 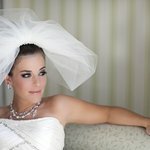 She specializes in bridal and special event makeup. Ginger moved to the US for a job at the age of 24, and was excited to grow and experience new adventures in a land of possibilities. Born and raised in Hungary, Ginger completed apprenticeships with some of the most skilled masters, while finishing cosmetology school. At the beginning of her career, she participated in over a dozen makeup competitions at national and international levels. Endless hours of practicing and hard work paid off when she earned several awards. Ginger’s 28 years of experience and drive for excellence in skin care and makeup helped her to develop a large client base and countless rave reviews. Ginger is dedicated to delivering unsurpassed service. Her passion and talent for makeup, professional work ethic, responsibility, and organizational skills are a big part of her success in this field. Book now, and experience the transformation Ginger is known for! Makeup services offered at Esspa Kozmetika and on location.